The Vector Institute will award up to 115 scholarships to meritorious students who pursue a full-time AI-related master’s degree in the 2019-20 academic year. Scholarships will be awarded to students in both core technical programs and complementary fields such as business and health care. 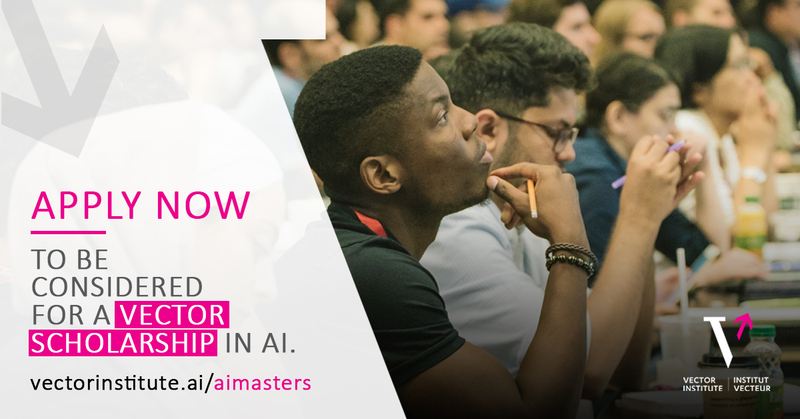 Graduates are highly sought after to work in leading startups and enterprises to help harness the full potential of AI to benefit the economy and our lives. Canada, the birthplace of deep learning, has been at the forefront of AI advancements for decades thanks to pioneering researchers like Geoffrey Hinton, Yoshua Bengio, and Richard Sutton. The new Vector Scholarship in Artificial Intelligence aims to attract top students to learn from some of the world’s best faculty based in Toronto, Ontario and across Canada. Have a GPA equivalent to first class standing. Scholarships are valued at $17,500 for one full year. All scholarship winners and students enrolled in Vector-recognized master’s programs become part of the Vector Institute’s network of students, faculty, and employers who share a passion for collaborating to advance AI research and applications. There has never been a better time to pursue an AI-related education and career. Leading global companies, promising AI startups and public institutions recognize that Canada is the best place to hire AI talent, with a growing workforce graduating in Ontario. Since its launch less than two years ago, the Vector Institute has been among a series of catalysts for over $1 billion of announced AI and tech-related investments, which will result in the creation of 25,000 jobs across Canada. Candidates interested in pursuing a Vector Scholarship in Artificial Intelligence can find eligibility and application details online at vectorinstitute.ai/aimasters. The Vector Institute is an independent, not-for-profit corporation dedicated to advancing artificial intelligence, excelling in machine and deep learning. The Vector Institute’s vision is to drive excellence and leadership in Canada’s knowledge, creation, and use of AI to foster economic growth and improve the lives of Canadians. The Vector Institute is funded by the Government of Ontario, the Government of Canada through the Pan-Canadian AI Strategy administered by the CIFAR, and industry sponsors. Internships, networking, and the Vector Scholarship in Artificial Intelligence are core components of the Vector Institute’s RAISE initiative, supported by the Government of Ontario, to develop and connect Ontario’s AI workforce to fuel AI-based economic development and job creation.